This is a simple breakfast common during the CNY season. Nian gao will harden after a few days, most people will fry it with egg to soften the cake and also given it a nicer flavour. Sometime if I have sweet potato and/or taro I would use them to sandwich nian goh and dip in egg to fry which is also very tasty too. Here is just a simple fried nian gao with egg. Dead simple to make. Cut some nian gao into slices about 5 - 6 mm thick. Beat 1 or 2 eggs with a little sugar. You need about 1 large egg per rice bowl of nian gao. 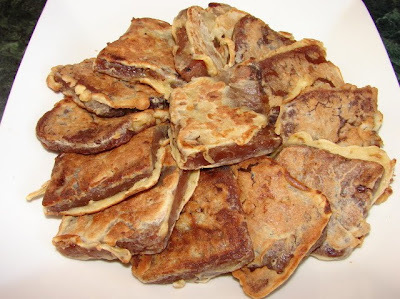 If anyone who finds the beaten egg very difficult to stick to the nian gao read on. Fry till the pieces are golden brown. Thanks again for all ur valuable tips as to how to make the beaten egg stick to the nian gao! Always agonises over the beaten eggs falling off the nian gao. You are a STAR!!!!!! Will be able to show off my new skill to my children now where they will have fried nian gao with beaten eggs really stucked on them. Hi Judy, hope you find this useful. I know it's a pain and waste of egg if it does not stick. I had totally forgotten about this - one of my favourites! Thank you for your tips. I've been wondering about it too. I thought I should have dipped the nian gao with flour first (pretty much like the regular breading technique).